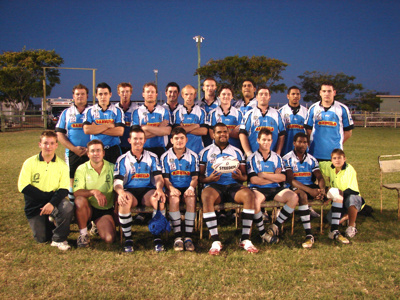 This image is a group photograph of the Hughenden Bulls Rugby League team, taken in 2008. Standing: Scott Watermann, -- , Ashley Murphy, Wesley Schultz, Joe Webb, Ryan ?, Aaron Mathers, Ben McLoughlin, Trevor (TJ) Major, Ricky Sumner, Ian Oui, Jason Kapernick. Kneeling/Seated: Luke Hubbard, Jamie Creagh, Greg Townley, Dale Smith, Shaun Bounghi, Daniel Smith, Rodrique Gela, Joshua Hengst.